After only seven hours and 136 hands, Day 4 has officially come to an end, with Britain’s Matt Perrins securing victory in Event #57: $5,000 No-Limit Hold'em. 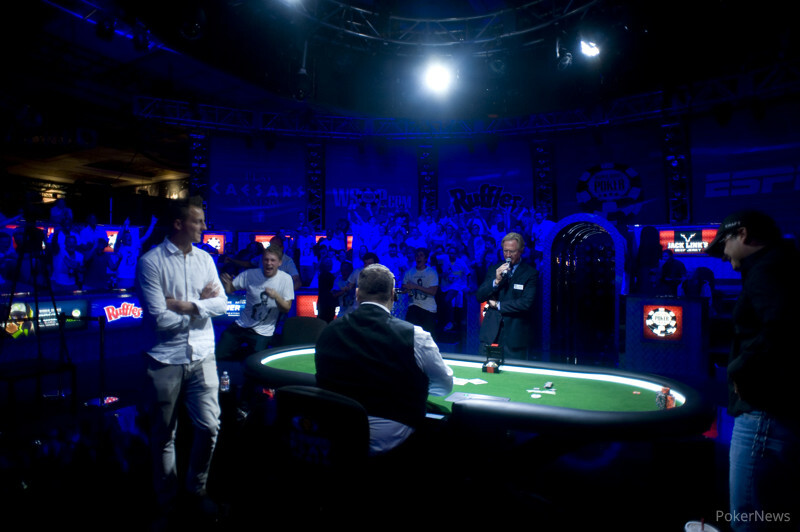 The young poker pro from Rochdale, England, started the final table as the chip leader, and didn’t look back, as he secured his second WSOP bracelet, after winning a 'No-Limit 2-7 Lowball' bracelet back in 2011. The final table got off to a quick start, with the shortest stack, Kent Roed, being eliminated first, when he ran his into Randal Flowers’ pre-flop, and didn’t improve. Joe Serock was unable to capture his first title, after he tangled with Matt Perrins in several hands, before finally moving all in with , only to come up against Perrin’s , before being eliminated in 8th place. Perrins would keep the heater going, when he eliminated Randal Flowers shortly after. Flowers opened to 100,000 and was met with a raise to 230,000, before he quickly moved all in, and was called. He tabled his , and was in great shape versus the , until the spiked on the turn, to give Perrins his next scalp. Seven hands later, and a short stacked Thomas Muehloecker moved all in, as did Antonio Buonanno, with none other than Matt Perrins making the call, putting both at risk. At the end of the hand, Buonanno was able to double, but Muehloecker was eliminated, collecting $129,477 for his efforts, almost the same amount as his career earnings combined. And only six hands later, we were left with four, after Matt Berkey was the unlucky recipient of a beat, as his run in this event came to an end. Cashing in his seventh event in this years series, and a fourth final table in a no-limit hold’em event, Berkey would move all in pre-flop after several raises against Perrins, holding against . Perrin’s rail begged for a seven, and received two, when the flop came down , having Berkey needing running cards to survive. It wasn’t to be though, as the cards bricked, sending him to the rail. Perrins would then eliminate his fifth opponent in a row, when his got the better of Antonio Buonanno’s , after the board ran out , to leave us with just three. The action was tight through out three-handed play, until the biggest pot of the night, saw both big stacks tangle. Arthur Pro opened the pot, before Seth Berger raised it up to 450,000. Perrins was next to act, and he opted to bump it up to 975,000, as Pro quickly got out of the way. Berger wasn’t going to give up there, as he min-raised it back to 1,600,000. Perrins thought about his next move for several minutes, before announcing all in, taking Berger by surprise. He tanked for over a minute, before making the call, which ended up being the right decision. His was in great shape against Perrins’ , but it seemed like this was Perrins' destiny, as he caught the in the window, much to the delight of his monstrous rail. He held, leaving a distraught Berger crying in the corner, having to settle for another deep run in this series, after already securing a second weeks earlier. Heads up play started with Perrins having a 10:1 chip lead over Arthur Pro, but he didn’t have it all his way, as Pro found some crucial doubles to stay in contention. However on the last hand, it just wasn’t to be, even thought Pro took the lead after flopping a pair. Perrins regained the lead on the turn, and one card later, he was guaranteed the victory, as his rail stormed into the middle of the Mothership, to congratulate their countryman. For his efforts, Pro would walk away with $489,451, and an experience to cherish for a lifetime. That concludes our coverage of Event #57. Thanks for tuning in to all the live coverage of what was definitely an exciting final table. Be sure to stay tuned, with the Main Event just around the corner, as PokerNews.com bring you all the action, here from the Rio All-Suite Hotel and Casino. Hand #135: Perrins opened for 200,000 and he was called by Pro. The flop came down . On the flop Pro checked to Perrins who bet 150,000 leading to a fold from Pro. Hand #136: On the button Pro opened to 350,000. Perrins announced an all in and almost immediately Pro called. Pro was ahead in the hand, but any combination of flops could easily give Perrins the lead. This flop came down which gave Pro top pair but improved Perrins' hand by adding a gutshot straight draw. "Ten!" the rail cheered for him. The turn wasn't a ten, but the on the turn did give him the lead. The on the river was safe for Perrins and with that, Arthur Pro was eliminated in second place while Matt Perrins captured the World Series of Poker Gold Bracelet along with first place prize money. Hand #132 Pro limped in, before Perrins moved all in. Pro contemplated his decision, before mucking his hand. Hand #133 Perrins opened to 200,000, which forced a quick fold from Pro. Hand #134 Pro moved all in and was called, as both players tabled their cards. Pro was all in and at risk, until the board ran out , to see him spike a nine on the turn, to double once again. Hand #125: Perrins opened to 160,000 and Pro folded his big blind. Hand #126: Pro moved all in from the button for 895,000. Perrins quickly called. The flop came down giving Pro a few extra outs to a straight. The turn was the , which was good for Pro to take the lead. The river kept Pro in the lead and allowed him to double up very quickly in this heads up match through Perrins. Hand #127: Perrins opened to 160,000 leading to a fold from Pro. Hand #128: Pro opened to 245,000. Perrins moved all in from the big blind. Pro laid down his hand allowing Perrins to pick up the pot. Hand #129: Perrins opened from the button to 160,000. Pro Called from the big blind. On the flop Pro checked to Perrins who put out a bet of 165,000. Pro called. On the turn, Pro checked for a second time. Perrins put out a bet of 305,000. After thinking about it for about thirty seconds, Pro folded. Hand #130: Perrins received a walk in the big blind. Hand #131: Perrins opened to 165,000, and was called by Pro. The flop came down . Pro checked his option before Perrins bet 175,000. Pro moved all in for 990,000 and Perrins folded. 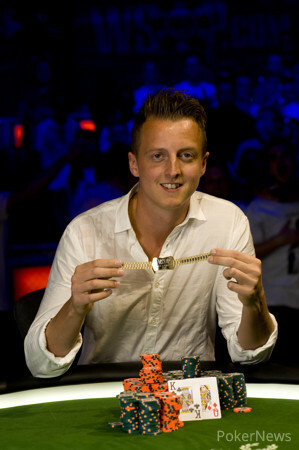 The remaining two players are taking a short break, whilest the staff organise the bracelet and chips. Hand #120 Arthur Pro called from the small blind, before Seth Berger bumped it up an additional 130,000 from the big blind. The raise was enough to see him take down the pot. Hand #121 Arthur Pro opened to 220,000 from the button, as Seth Berger went into the tank from the small blind. After a few minutes, he opted to raise it up to 680,000, as Matt Perrins quickly got out of the way. With the decision back on Pro, he thought about his decision, before finally releasing his hand. Hand #122 Seth Berger opened to 145,000 from the button, which was enough to take down the pot. Hand #123 Matt Perrins opened to 160,000 from the button and was called by Seth Berger from the big blind. The flop came down , as Berger checked, before Perrins threw out a continuation bet of 175,000. Berger called, and both watched as the fell on the turn. Berger checked again, as Perrins bet out another 330,000, which was enough to take down the pot. Hand #124 Arthur Pro opened with a bet, before Seth Berger raised it up to 450,000. Matt Perrins then opted to re-raise to 975,000 in chips, as Berger went into the tank. 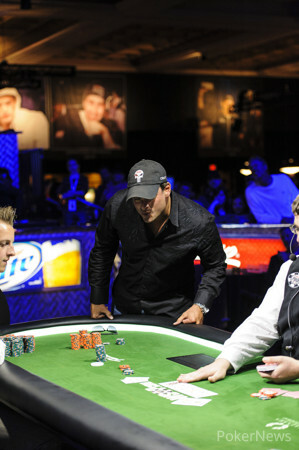 After thinking for a few minutes, Berger pulled back his original raise, before sliding out a five-bet to 1,600,000. After another minute, Perrins moved all in, as Berger sat back in his chair, completely surprised by his opponents move. He shook his head, and stared down the bet, before finally making the call. 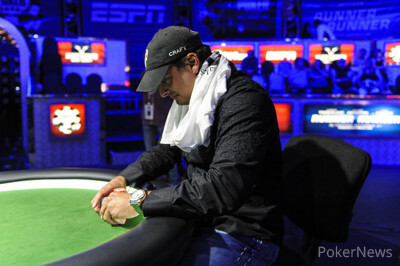 Berger had less chips, but had made a great call, holding the better hand, as the dealer went to spread out the flop. “Kiiiiinnnnngggg,” pleaded Perrins' rail, before the flop came down . An eruption of cheers broke out, as Perrins took the lead, with Berger throwing his hands on his head, pacing around the final table. Unfortunately for him, the board ran out the and to see eliminated in third place, as we head to heads-up. Hand #115: Matt Perrins received a walk in the big blind. Hand #116: Matt Perrins limped in from the small blind and Pro checked his option. The flop came down and Perrins led for 85,000. Pro called. The dropped on the turn. On the turn Perrins led with a bet of 190,000. Pro called. The river was the and on that river Perrins checked which drew a bet of 425,000 from Pro. Perrins folded right away. Hand #117: Matt Perrins folded on the button. From the small blind Arthur Pro raised to 200,000. From the big blind Seth Berger put in a reraise to 550,000. 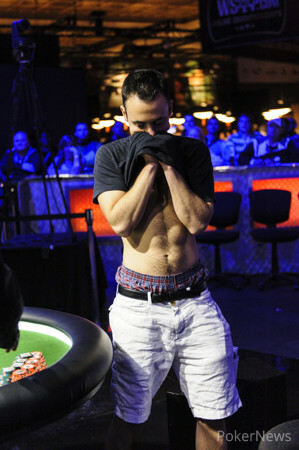 Pro went into the tank and folded after about a minute, allowing Berger to take down the pot. Hand #118: Seth Berger raised from the small blind and took it down after Perrins folded. Hand #119: Perrins limped in from the small blind, leading to a check from Pro. The flop came down on which both players checked. The turn was the and Perrins led at the pot with a bet of 125,000. Pro just called. The river was the and Perrins led with his second bet in a row, this time for 400,000. Pro mucked his hand, allowing Perrins to scoop the pot. Hand #110 Seth Berger opened to 175,000 from the button, before Matt Perrins bumped it up to 450,000 from the small blind. The action folded back to Berger, who then opted to re-raise. He was cutting out his bet, but Perrins beat him to the pot, mucking his hand. Hand #111 Matt Perrins opened to 160,000 from the button, and took down the blinds and antes. Hand #112 Arthur Pro opened to 275,000 from the button, which was too big for the blinds, as he took down the pot. Hand #113 Matt Perrins called from the small blind, and Arthu Pro checked, as both watched the flop come down . Perrins bet out 85,000, and was called, as the fell on the turn. Perrins quickly reached for chips, and slid out 235,000, which forced a fold from Pro. Hand #114 Matt Perrins opened to 160,000 from the button, and took down the blinds and antes.